The Heritage Plaque program was launched in 1992 by the Maple Ridge Community Heritage Commission "to help build public understanding of the value of our built heritage, and to create a climate of support for the preservation of valuable older buildings." The Community Heritage Commission granted the following plaques in Whonnock and Ruskin. The text is taken from the plaques. Built in 1914 on land donated by John Brodie, Mr. Robert A. Hamilton's plan was utilized for the church building. It was constructed by carpenter Olaus Lee who was assisted by volunteer labour. The church was dedicated on the second Sabbath of September, 1914. The minster of the congregation was the Reverend George Fisher. Following the union of Presbyterian, Methodist and Congregational churches in 1925, Whonnock Presbyterian Church became the Whonnock United Church. The church hall addition was built in 1933 and the belfry was attached to the church building roof. The church building has been maintained by the faithful congregation and has been a house of worship from 1914 to the present time. The two-room Ruskin School was built in 1916 to replace the original 1896 one room school. The two acre site on which the school stands was donated by property owner Charles Whetham. In the fall of 1919, Ruskin School became a superior school, taking students up to second year of high school. Ruskin School is the only surviving school [building] from this era in the Maple Ridge-Pitt Meadows School District. The Anglican Parish of Whonnock BC originated with the construction of the Church of St. Paul on land given by a Mr. Noble Oliver. The building was financed by an anonymous gift of $800 and constructed by a Vancouver firm. Essential liturgical furnishings were donated and monthly services began with a Rev. Haddon on New Westminster. In 1921 a new church was built and the parish name was changed to that of St. John the Evangelist. The first church hall at St. John's was built and dedicated in the 1930s and was replaced with Cameron Hall in 1985. The parish has existed sometimes independently, sometimes in association with other parishes in Maple Ridge or Mission bit, today stands alone as an independent parish, wholly supported by a small but faithful congregation. Ruskin Community Hall was built in 1923 after the first community hall burned down in 1922. The first hall was the old Ruskin schoolhouse, and pulled across the road to this site. Mr. Albert Miller prepared the plans for the new hall. The Abernethy and Lougheed Logging Company donated the hemlock lumber that was delivered to the wharf at Ruskin and hauled up the hill to the site. The Stoltz Manufacturing Company donated the roof and shingle material. Many volunteers and local residents participated in the building work. Today the Hall is still an important local meeting place for the Ruskin community. 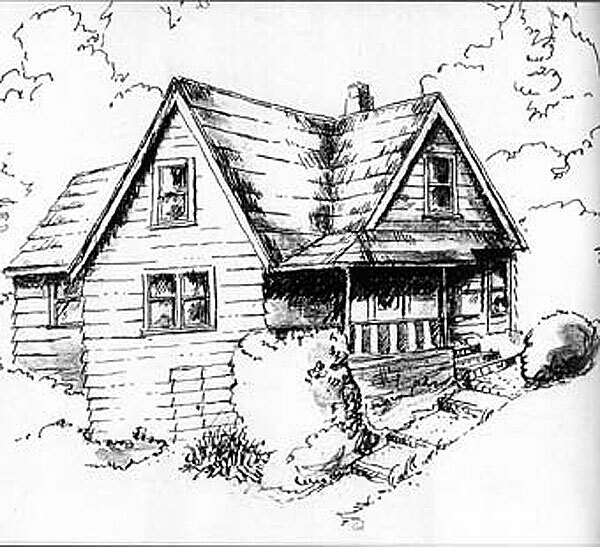 This is one of two neighbouring homes that were constructed as speculative houses in 1931 and 1932 by contractors Ralph Daniels, Ray Steves, and Richard Whiting, for Mrs. Winnifred Gordon. This home was used for rental purposes until Mr. and Mrs. Byrnes purchased and moved into it in 1946. The Byrnes family later built later purchased the neighbouring house in the 1960s and it continues to be used for guests and family accommodation. These homes are situated on two lots in historic Whonnock Centre and are surrounded by mature shrubs, trees and rhododendrons, and an extensively landscaped yard, which provides and excellent setting for these heritage dwellings. While these homes have the appearance of sharing one common site, they were built and remain on individual lots. The homes are typical of homes constructed in that era with gabled roofs, open verandas and barn shake roof covers. The building material used during the construction were common at that time, and the original cabinetry, cedar and fir flooring, fir and pine ceilings, windows and fixtures remain with the homes. Postal service was established in Whonnock in 1885. This small postal station was built by .S. Whiting; it was rebuilt in 1928 and again for the final time in 1932. It stands in the very centre of the Whonnock commercial area and is symbolic of the community that it has served for many years. This commercial building was built by Nils C. Nelson, a local carpenter. The storefront retains its centered entry. It served as a grocery store for many years and now houses a feed store. It remains part of the historic core of Whonnock. Around 1890, closely related families came to Whonnock from an area near Trondheim, Norway. The men were farm labourers and fishermen with names such as Lie (Lee), Nilsen (Nelson), Anderson, Knudtsen and Mathias (Mattisen). In 1895 they established the "Trondheim Scandinavian Evangelical Congregation of Whonnock B.C." The women gathered in the Lutheran Women's Association, the working arm of the congregation. In 1904, Ole Lee Jr. provided land for a church yard for the congregation and the following year the Norwegians built a small church here, facing the street. Services were held in Norwegian. In 1985, when most of the original settlers had died and many of their descendants had moved away the church on the cemetery was dismantled. For many years Ted and Hank Lee took care of the upkeep of the old cemetery. In June 1982 the property was transferred to the District of Maple Ridge and made part of the Whonnock Cemetery. The graves of the Norwegian settlers are in the back of the property. In front, near the road where the church once stood, are other graves. This part of the Whonnock Cemetery is no longer used exclusively for the people of Norwegian descent.